Francisca Ordega battles for ball with Banyana players. The Super Falcons of Nigeria proved unbeatable once more as they overcame a stubborn South African Banyana Banyana squad on penalties after a scoreless 120 minutes to retain their Women Africa Cup of Nations title in Accra on Saturday. It was the third successive win and ninth overall for the Nigerian girls. Triumph was achieved despite the Falcons missing injured striker Desire Oparanozie, and on the back of a 75th minute penalty miss by Asisat Oshoala. It was also against the backdrop of playing consecutive 120 –minute sessions, four days after surviving a battling semi final against Cameroon. Opportunities were few and far between in a tight and cagey game in the Ghanaian capital. Both teams watched each other’s heels closely. 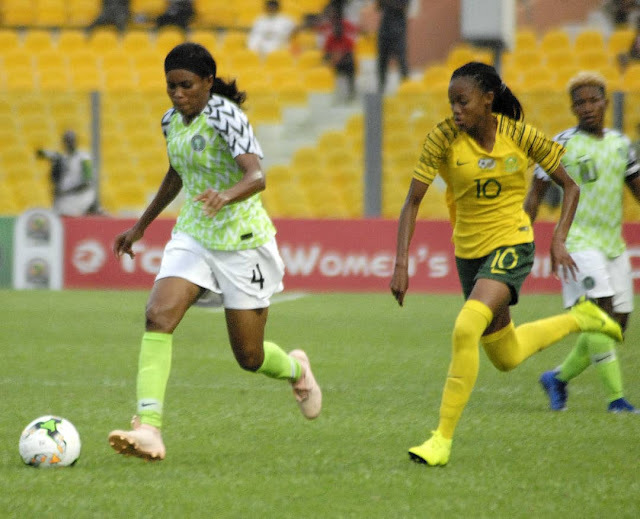 Eventual Woman-Of-The-Match, Francisca Ordega on the Nigerian side, and top scorer Thembi Kgatlana on the South African side, came close with sweet touches in the closing stages of the first half, and just before the interval, Rasheedat Ajibade should have done better as the ball spilled to her from a corner kick. In the 48th minute, Ordega blasted a good chance over the bar, and 14 minutes later, Ngozi Okobi’s good move and pull –out was overhit. In the 75th minute, Ordega ran determinedly onto a brilliant pass from Okobi, but was scythed by goalkeeper Christen Swart. Zambian referee Gladys Lengwe awarded a penalty, but Oshoala screwed her shot and it went away. Okobi and Ordega would miss chances late on, and substitute Nompumelelo Nyandeni came close with five minutes left but goalkeeper Tochukwu Oluehi, excellent throughout, was on call. Oluehi would save from Kgatlana and Linda Motlhalo in extra time, just as Oshoala watched a good shot stopped by Swart. In the shoot –out, Onome Ebi missed Nigeria’s first kick, hitting the upright, but after Alice Matlou and Ngozi Ebere netted, Lebohang Ramalepe booted her effort wide. 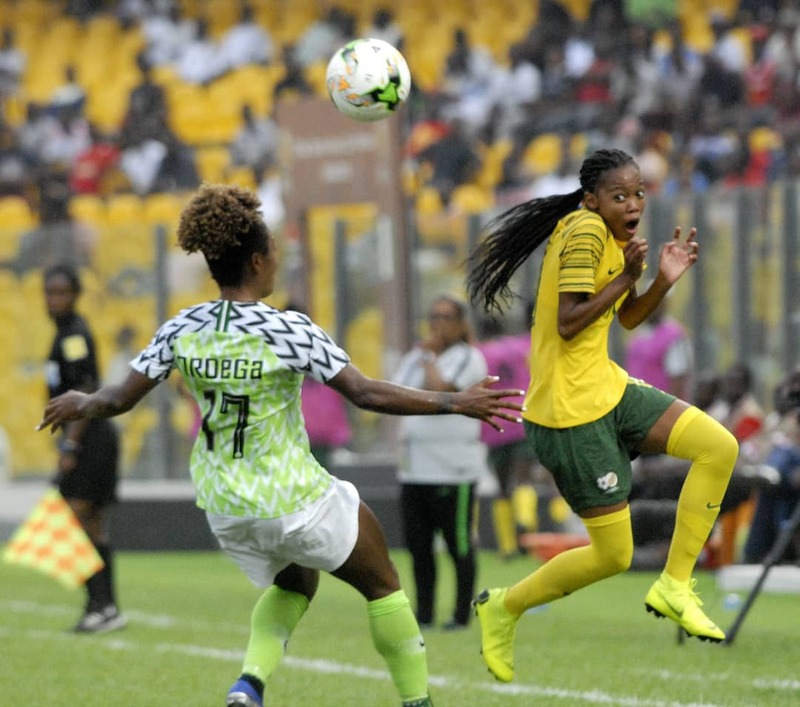 Rita Chikwelu and Nyandeni scored, as did Chinwendu Ihezuo and Mamello Makhabane, but after Chinaza Uchendu found the roof in a cool manner, Motlhalo watched in agony as Oluehi stretched to stop her kick and hand Nigeria the trophy. President of the Nigeria Football Federation and CAF 1st Vice President, Amaju Melvin Pinnick, whose birthday it was, told thenff.com: “This is very special for me, coming on my birthday. I am very proud of the Super Falcons of Nigeria, and I congratulate them for doing our country proud. “We dedicate this trophy to President Muhammadu Buhari (GCFR). Bronze medal winners, Cameroon, who also qualified for the FIFA World Cup, picked up the Fair Play trophy.